Local logger looks to new career path working in a different way with wood. It is at the heart of our community but many people don’t know much about it or even stop to appreciate it. It’s not a flashy tourist attraction or a well-used civic building but it is of great significance to Comox Valley residents as well as visitors. It’s the Courtenay River Estuary. And Project Watershed is looking to change the perception of the estuary this fall by organizing the “Heart of the Watershed: a Symposium on the Courtenay River Estuary”. To be held on October 3-4, the program will look into the history and importance of the estuary as well as present conditions, challenges and visions for the future. Events will include guest speakers, displays, workshops and field trips designed to increase the understanding and awareness of the work being done to protect and restore the estuary. 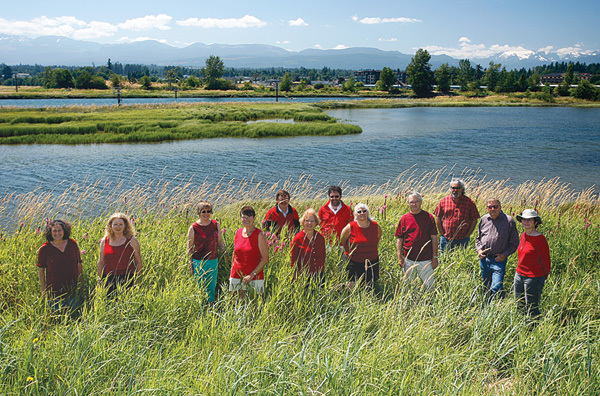 The rapid growth of the Comox Valley is putting extra strain on the local rivers and wetlands. The water quality of Baynes Sound has declined over the past decade, many wetlands have been lost through urban development and shorelines have been cleared or changed for developments, agriculture and aquaculture. The Courtenay River Estuary is part of a ‘super-estuary’ that includes Baynes Sound and Georgia Strait. This area is of national and global significance in terms of wildlife and economics. Roughly 50 per cent of British Columbia’s shellfish industry operates in Baynes Sound. Also, estuaries are visited by more than five million migrating waterfowl in British Columbia every year. During the peak of the herring spawn, more than 60,000 birds descend on our region. The health of Baynes Sound is dependent on the health of all the watersheds that flow into it. To ensure these areas are protected, Project Watershed has new programs that have been designed to increase public awareness and understanding of positive steps that can be taken to change how both wastewater and sensitive habitats are managed. The Courtenay River Symposium is one of these educational programs. To highlight the importance of estuaries, Project Watershed has lined up several keynote speakers for the symposium. Dr. Thomas Homer-Dixon whose books include The Upside of Down: Catastrophe, Creativity, and the Renewal of Civilization and The Ingenuity Gap will focus on increasing resilience of human/natural systems as vital to renewal in the face of change. Dr. Will Marsh, author of several books and papers on landscape planning and environmental management, will discuss the need to address systems, including watersheds, longshore and groundwater, in planning for sustainable communities. Dr. Rob Butler, adjunct professor at Simon Fraser University and president of the Pacific Wildlife Foundation, will speak on the significance of the Courtenay and Comox Valley in relation to the Pacific Flyway and the Strait of Georgia. Other speakers will include Wedlidi Speck, who will offer a First Nations perspective. Nancy Greene will present her archaeological research on the significance of the fishing weirs of the estuary and Dan Buffett of Ducks Unlimited will have information on the ranking of the Courtenay Estuary among BC estuaries. Tim Clermont of the Nature Trust will include updates on a proposed Wildlife Management Area for the entire area, including Baynes Sound. Michele Deakin of Mid Vancouver Island Habitat Enhancement Society will speak on the example of the Englishman River Estuary. There are many more speakers and activities scheduled for the two-day symposium; visit the Comox Valley Project Watershed Society website over the summer months for regular updates and more information.